Moga: The pro freedom body Dal Khalsa while Dubbing Jan 26 the Republic Day of India as a day of deceit and assimilation, believes that with the adoption of present Indian Constitution, the Indian State had robbed the Sikhs of their separate distinct identity and foisted Hindu laws on the Sikh people. 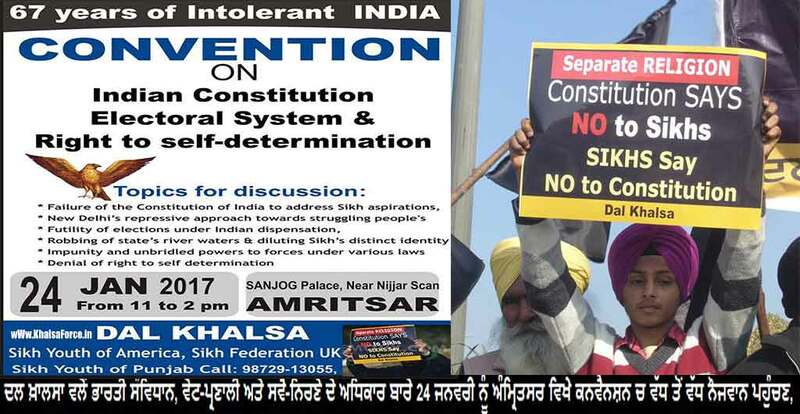 The body lamented that the present constitution of India denies minorities their rights including right to self-determination as recognized under International law, the Dal Khalsa has decided to organize protest demonstration on Jan 26 at Zira town. As India will observe its 68th republic day, the Dal Khalsa has resolved to protest against the Constitutional wrongs and injustices. This was announced in a press meet by party’s spokesperson Kanwar Pal Singh. Flanked by AISSF head Karnail Singh Peermohammad and Surjit Singh Khalistani, he said the Dal Khalsa and its allied groups mainly AISSF, Ek Noor Khalsa Fauj would stage a spirited protest against what they termed as Constitutional denials and discrimination. Sharing the strategy of their protest with the media persons they said that the demonstration will be peaceful and that there would be no disruption of traffic. Whilst the mainstream political parties of Punjab have started electioneering, he said theirs group would also hold a Convention on Indian Constitution, electoral system and right to self-determination on Jan 24 in Amritsar. The Pro freedom groups gave a call to masses to stay away from official and non-official functions of Republic Day across the state in protest functions of Republic Day across the state in protest. While the government machinery celebrates this day, our appeal to the masses was to stay away from celebrations and reflect on the history of the dark shadow which this Constitution has brought over to Punjab over the past 67 years. Kanwar Pal Singh further said that the Sikhs should observe 26th Jan as betrayal day, as there was no reason for Sikhs to celebrate India’s republic day. Rather it should be a day to pledge to reinforce our efforts to break the shackles of constitutional slavery. Moreover he made it clear that Sikhs do not have any enmity with India or its people but their fight is with the rulers and policy makers of this country who have betrayed the Sikhs and who are a main hurdle in granting right to self determination to our people.